Searching for the solution to your lone worker safety problems but don’t know what to look for? We’ve identified 5 key factors that go into making the best safety monitoring system. The comparison guide scores each one using the traffic light system, making it quick and easy for you to tell which one is right for you. 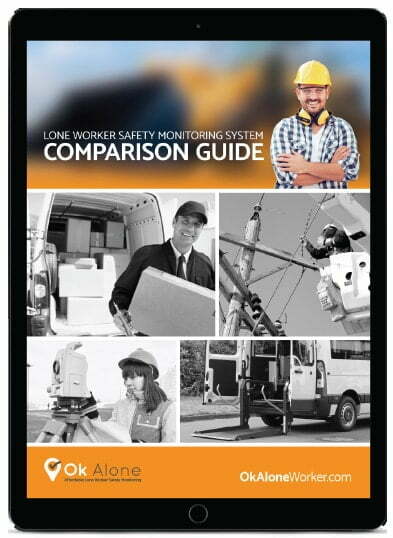 Download your lone worker monitoring system comparison guide – for free! Get your copy of the guide now. All you need to do is tell us which email address you’d like us to send it to using the form. Is it built around your company’s own safety policy? Does it implement the procedures you want? Does it guide your team to take the actions you want at the appropriate times? Is the system easy to use? How easily can the system be implemented into your everyday work? How intuitive it is? Can it adapt to how you do things, or do you need to adapt to it? Can you locate your staff with GPS tracking? Do you know where they are and where they have been? How much does the system cost to buy and to run? Will you have additional expenses for hardware, training or set-up fees? Are you able to control the system the way you want to? Do you get the information you need about what happens to your staff? Is the system a good management tool that enables you to control your business effectively? Great! Thanks for filling out the form. Your Comparison Guide will be emailed shortly.